Last November marked the centennial of the end of the First World War. I realized too late that I had an image and could post a personal story on the subject. On the eleventh hour of the eleventh day of the eleventh month of 1918, the combatants signed an armistice and the “War to End All Wars” ended. Wars often spur technological advances as a nation’s brain power concentrates on new ways to kill the enemy. Witness World War II as it began with rickety bi-planes and ended with jets and the atomic bomb. World War I introduced tanks, flying machines, flamethrowers and poison gas…and it was fought largely as a brutal, protracted stalemate in water-logged trenches strung across most of western Europe. It was a miserable affair that killed ten million combatants and nine million civilians. In April of 2006, we took our first river cruise in France. On this day, we were docked in the town of Chalon sur Soane. On the waterfront stands the town’s War Memorial. 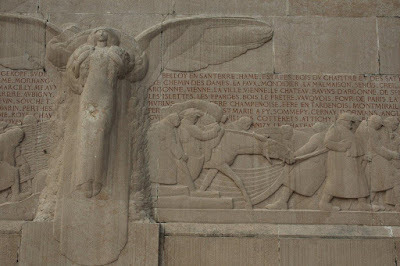 On one side, facing the river, there are carvings of an angel, soldiers slogging forward along with a horse (that was the last war where beasts of burden were widely used) and, I’m guessing, the names of battles and engagements fought by the townsfolk. Then you look around to the other side of the monument and see the names. 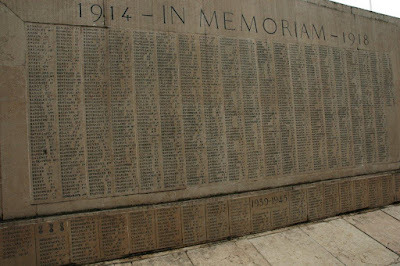 It appears the memorial was originally dedicated to the Great War and the casualties of the Second World War were added later. Given that France fell to the Germans early in the second war and there was not much fighting until the allies began the offensive eastward through the country after D-Day in 1944, one might understand why there are relatively few names in the 1939-1945 space…204 to be exact. Contrast that with the death toll that occupies the rest of the wall. I counted 1014 souls recognized from the 1914-1918 conflict. Imagine town life without so many of the men. Imagine the toll on this relatively small community. Your post may have come too late for the centennial but not too late to, hopefully, spur folks to see Peter Jackson's excellent documentary on the war, "They Shall Not Grow Old". It had a very limited release in December and January but as of February 1st it is now in theaters everywhere.